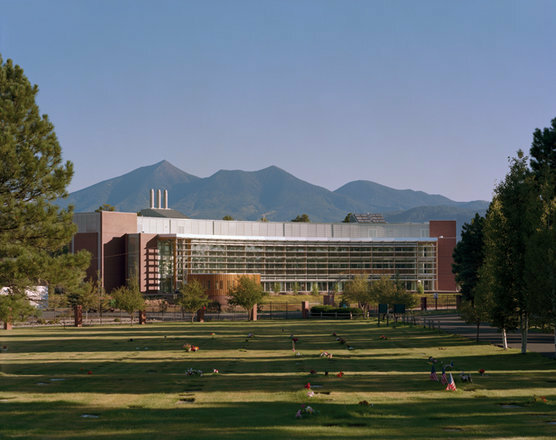 The Advanced Research and Development Facility at Northern Arizona University has recently been awarded the RIBA's International Award - the only building in the United States to receive it. Tony Chapman, head of the awards commented "The building uses 90 percent less energy than its equivalent counterparts on US university campuses. One-third of the construction materials were recycled from elsewhere. Yes, it is located in Arizona, and the building relies on an adjacent field of photovoltaics and a huge solar hot water collector, but that only begs the question of why no American architects designing in similar locations had previously picked up on these natural advantages." Chapman added that the building "might be claimed as perhaps the most environmentally efficient building to-date" in the United States. The judges praised the project's designers, calling the facility "typical of the work of Hopkins Architects for incredibly well thought out and crafted modern design. This exemplar of sustainable design shows that remarkable environmental savings can be made without hysterical formal manipulation or self-congratulatory eco-posturing." The LEED™ 'Platinum' rated building was designed by Hopkins Architects in collaboration with Burns Wald-Hopkins Shambach of Arizona.